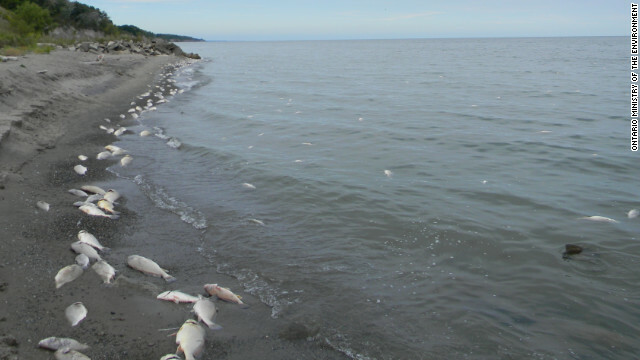 Tens of thousands of dead fish have washed up on a 25-mile stretch of Lake Erie's northern shore, and Ontario environmental officials say they could be victims of a natural phenomenon called a lake inversion. The inversion brings cold water, which has lower oxygen levels, to the lake's surface and fish suffocate. "Essentially it's a rolling over of the lake," Ontario Ministry of the Environment spokeswoman Kate Jordan told The Chatham Daily News. "Something - whether it be a storm, or cooler temperatures at night, or strong winds - triggers a temperature change in the lake." "The ministry did not observe any evidence of a spill or pollution and water quality measurements done did not show anything unusual," Jordan told CNN. "I haven't seen anything like this in quite some time," the Daily News quoted him as saying. "The interesting thing is that most of the fish are sizable. There are very few little ones." "I had family here (on Monday) and I didn't allow them to take the dog or the children down to the beach," Chatham-Kent resident Patricia Pook told CNN affiliate CBC News. "I knew it was bad, but the smell is just overwhelming. It would make you sick to your stomach." The stinky democrats that pollute northern Ohio and Michigan won't notice the smell. Maybe before all the "experts" begin posting, we should all wait to see what the real experts find. I saw that Obama put his feet in the water just before the fish kill. Muslims dont believe in washing all too often. I noticed all the fish named were basically bottom feeders. Seagul deaths could be from ingestion of the fish flesh. I can't tell if you mean sea gulls or Smeagol. "The inversion brings cold water, which has lower oxygen levels, to the lake's surface and fish suffocate." This must be 'new science'; when I was a kid and dinosaurs freely roamed, cold water held more oxygen (or any gas) than warm water. Test one or more of the fish and you'll have you answer re: sewage or not. Disgusting. Poor fish. The deep 7.9 in Costa Rica sent recorded s-waves all the way up New Madrid fault to Lake Erie. Possible release of natural gas simular to sink hole that opened in Ontario. More 7 magnitude quakes than usual in the last week including the artic circle 7.7 then 7.6 Indonesia. Strong magnetic flux from Sept 3rd CME impact may have also cased the mass whale beachings in Fla & Scotland. Add strong winds and multi-effects create complicated reactions. Now for a fun fact: 101 days between the 11th anniversary of the 9-11 tragedy and 12-21-12 solstice. My extended family has lived on Lake Erie since turn of the last century, in New York between Wendt Beach and Evangola State Park. Thermal inversions a a way of life on the lake. I cannot count the number of times that we saw the results of thermal inversions between our cottage and Point Breeze alone. Yes, the fish stink, and yes you spend the better part of a day burying them, maybe two days. Thermal inversions happen. What was the pH level at? The fish committed suicide at after hearing hussein speak of how we are all better off since he came into office with less actual votes. Guess where you get your bottled water from??? Yep thats right, the great lakes... I am sure that no one (especially our wonderful government) would ever do anything to hurt us americans!?!? Yeah, right!